Ten years ago my first book was published by Penguin and won a few awards. I’m thrilled to announce that I spent the past year revising that popular book, and the Revised Edition is now available. It has a slightly different name – Autism Spectrum Disorder: The Compete Guide to Understanding Autism. To celebrate the publication of this updated book, a fundraiser book-signing event is taking place in San Diego. I’ll be on-hand to sign books. Proceeds of book sales that evening will benefit NFAR. Shannon Vajda and Robin Champlin, Esq. are sponsoring the event. 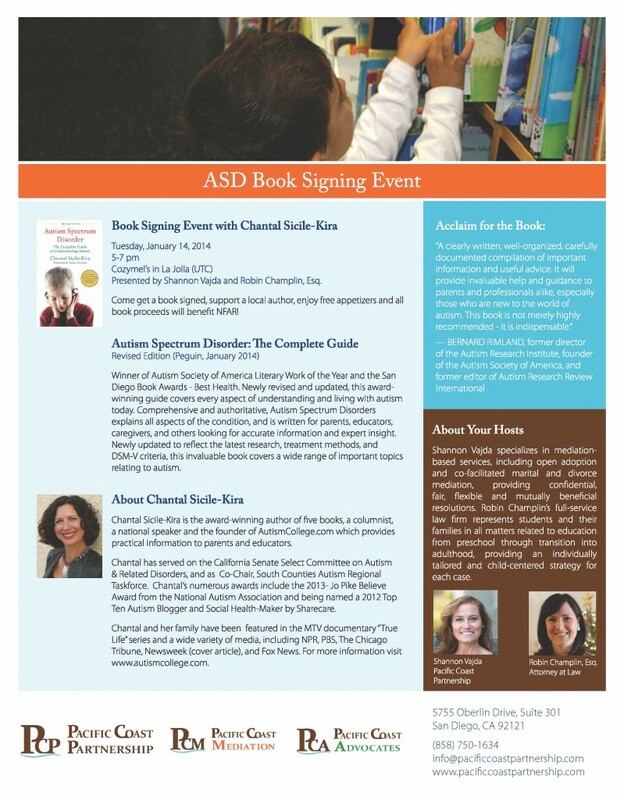 So come get a book signed, enjoy some free appetizers, and support a local autism organization! About Your Hosts – Shannon Vajda (Pacific Coast Partnership) specializes in mediation-based services, including open adoption and co-facilitated martial and divorce mediation, providing confidential, fair, flexible and mutually beneficial resolutions. Robin Champlin’s full-service law firm represents students and their families in all matters related to education from pre-school through transition into adulthood, providing an individually tailored and child-entered strategy for each case. About NFAR – NFAR’s mission is to help in the development, expansion and support of autism programs and services that improve the quality of life for children and young adults with autism in the San Diego Region. About the Book – Newly revised and updated, this award-winning guide covers every aspect of understanding and living with autism today. Awards for the book include Outstanding Book of the Year – Autism Society of America, and Best in Health – San Diego Book Awards. 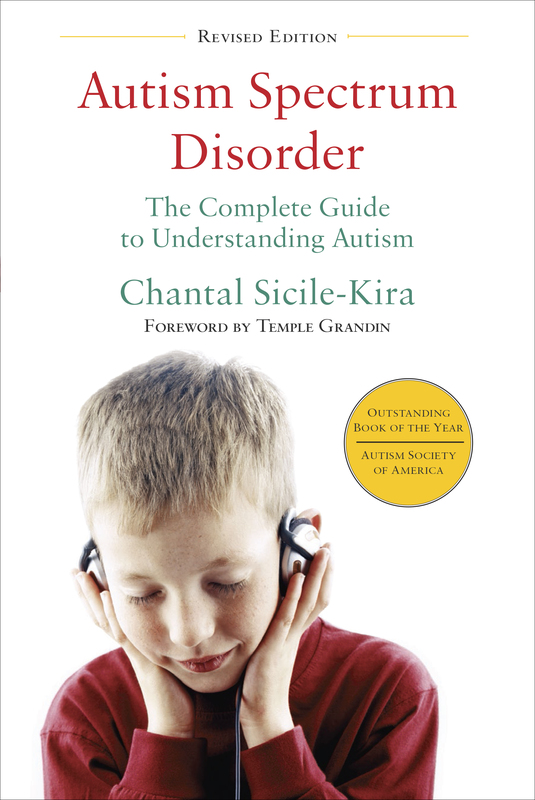 Comprehensive and authoritative, Autism Spectrum Disorder explains all aspect of the condition, and is written for parents, educators, caregivers and others looking for accurate information and expert insight. Newly updated to reflect the latest research, treatment methods, and DSM V criteria, the invaluable book covers autism from diagnosis to adulthood. 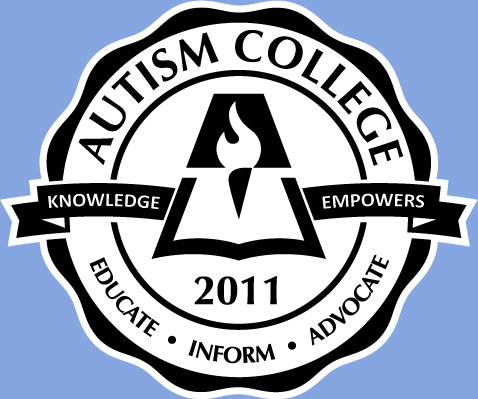 “Autism Spectrum Disorders is a tremendous resource for families caring for children and adults with autism. While sharing her personal experiences of a parent of a child with autism, Chantal Sicile-Kira provides insights and resources that are often missing from many of the books on this topic. Quite simply Autism Spectrum Disorders simplifies many of the complications that families face in navigating systems of care and in doing so, she gives families hope and great inspiration.” – Areva D. Martin, Esq., Co-founder and President, Special Needs Network, Inc.